I often talk openly about money, personal finance, and the debt free lifestyle that I so strongly believe in. In fact, I am sure that some people wish that I would just shut up about it. After all, who wants to hear someone making good points about how to live a less stressful life without debt? Because of these conversations I often have, I really get to see where people stand, as well as why they are struggling themselves. It is also hard to have these kinds of conversations without politics coming into question. I would prefer that didn’t happen but the truth is that a lot of people think that they cannot have something unless Washington gives it to them. In the greatest country the world has ever known this could not be further from the truth. The founding fathers created a nation where ideas, passion, hard work, and FREEDOM give us the opportunity to be what we want to be. I will not say that there are not obstacles, but obstacles are what teach us how to be successful in the first place. Successful people fail far more often than unsuccessful people. They do not quit and they do not let anything stand in there way. They take responsibility for themselves and they try to make lemonade out of lemons every time! They do not sit back and whimper that the Government won’t give them this or that, or that someone else is the reason for their problems. You cannot rely on other people to make you successful, because in America “We The People” are the most powerful. The founding fathers gave us the rights that allow us to reach for the sky. If we make better decisions with our time, money and values the sky is ours. If you believe that the Government holds the answers to your happiness, then it will be very hard for you to experience hope. If anything the government robs us of incentive and hope by trying to pretend that they can solve our problems. When they fail as they so often do, hope is lost, which in turn kills incentive. If Americans dumped their debt, Washington would not NEED to save anyone. If we were not weighed down by tons of debt, we as a people could do more to help society prosper. We could do what the Government has failed to do over the past 40 or so years, if we simply stopped living in denial. YOU Did It, So YOU Fix It! “YOU are where you are today because of the choices that YOU made yesterday.” After saying this to many of my friends I usually hear this: “I don’t choose the bad things that happen to me.” I agree, you don’t, but YOU DO choose how well you prepare for those obstacles. If you use debt in your life that is YOUR choice. If you do not have any savings in the bank, that is YOUR choice. If you do not have a plan, that is YOUR choice. If you come home one day and find that you have a serious plumbing issue to deal with, you certainly did not choose it. However, the choices YOU made prior to that happening left you unable to handle it properly. The average person would be blaming everyone BUT themselves for their new problem. Those people need to look in the mirror for a more honest reflection of the real problem. If a farmer wants a successful crop, he has to prepare for the rain. If a farmer decides not to prepare for the rain, and instead decides to leave it to chance, the results will reflect those choices. The farmer that did not prepare has no right to be angry with anyone but himself. With that said, the recession did not cause your financial problems, YOU DID! It is what you DID NOT do before the recession that has you squirming! You did not prepare for the rain and your crop is lacking because of it. Do a DREAM budget. Here’s what I want you to do differently though. Keep your current income, but do the budget as if you had NO DEBT whatsoever, except the house. (budget for the basics, NO car payments, NO credit card payments, NO furniture payments, NO home equity lines of credit, etc.) For fun take off extras like cable TV, subscriptions, eating out and anything extra that would likely be considered a want vs. a need. If your house is over 40% of your annual take home pay then dump that too. In place of the bloated mortgage allot 25% of your annual take home pay for housing just to see what you could afford with a normal payment. 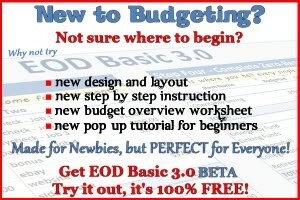 What does your budget look like? How much extra money per month do you have to save, invest and give? Do you think that your stress levels would be lower than now when thinking about your finances? Most people will ignore this challenge but not YOU, because YOU want to find out that you are more powerful than the Government. I am an advocate of personal responsibility and enjoyed this article. The Bible says “God helps those who help themselves.” and it makes an super matra for personal responsibility. I think the DREAM BUDGET is an excellent ideal. It motivates you to see what can be if you put in a little hard work.